First Read's Morning Clips: Could Arizona go blue this year? 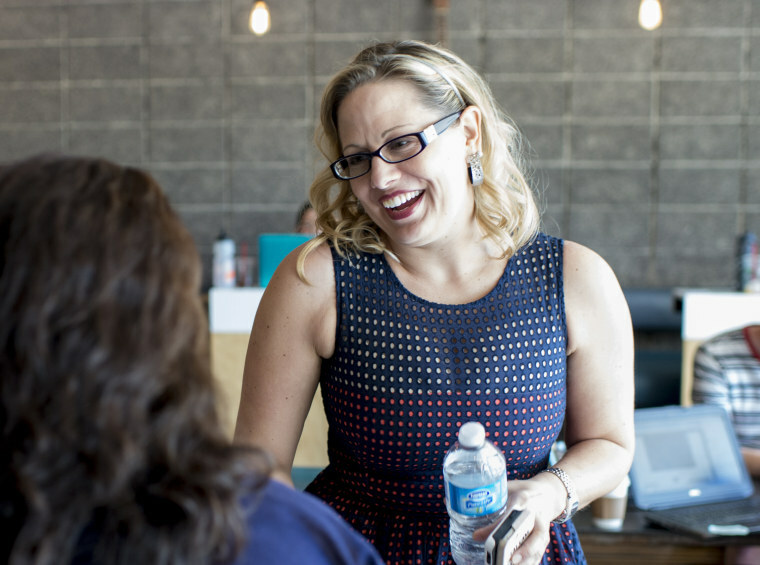 UNITED STATES - AUGUST 8: Rep. Kyrsten Sinema, D-Ariz., shakes hands with a constituent at Giant Coffee in Phoenix on Thursday, Aug. 8, 2014.Bill Clark / CQ-Roll Call,Inc. MIDTERM MADNESS: Is 2018 the year Democrats finally turn Arizona blue? The Wall Street Journal looks at how the Mueller indictments from Friday are adding extra urgency to preparations for the midterms. Obamacare is now a major part of Democrats’ midterm strategy. 2020: Trump has raised more than $88 million so far for his reelection campaign. Mayors are getting in to the presidential speculation game, POLITICO writes. AZ: Politico asks if 2018 will be the year that Democrats can finally turn Arizona blue. CA-SEN: Big news over the weekend in California, via NBC’s Alex Seitz-Wald: The California Democratic Party endorsed Kevin de León over Dianne Feinstein. That audio came up a lot during the last debate before the runoff election, notes the Atlanta Journal-Constitution. HI-GOV: Colleen Hanabusa’s big lead appears to have evaporated. IL-GOV: A new ad that accuses Bruce Rauner of profiting off of family separations is causing controversy in the governors’ race. And Crowley declined to endorse Pelosi for Speaker. TX-SEN: Beto O’Rourke is hoping to use Obamacare to beat Ted Cruz. WI-SEN: Kevin Nicholson has penned an op-ed for Fox News about his family’s Democratic roots — and why his parents are supporting his opponent. The Washington Post highlights the pressure on Trump to confront Putin — and the signs that the American president is mostly underscoring what he has in common with Putin instead. Trump is blaming his predecessors in the United States for poor relations with Russia. Could the U.S. put the indicted Russian intelligence officers on trial? NBC’s Danny Cevallos looks at the legal questions. NBC’s Alex Seitz-Wald reports that Supreme Court nominee Brian Kavanaugh will face questions in his confirmation hearing about whether he misled Congress in 2006 about his involvement in Bush-era detainee policy. Kavanaugh’s judicial heroes are mostly more conservative than Anthony Kennedy, the Washington Post writes. And finally, the temporary chief of the EPA could hold that job for years without a Senate vote, Bloomberg notes.